Elsie loves chocolate, so when she’s granted a wish, there’s only one thing she wants: to turn everything she touches into chocolate. It should be heavenly, but is it…? 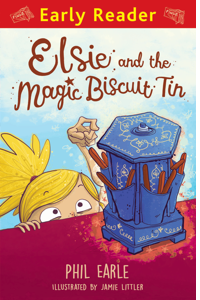 Elsie’s always known that there’s something a little bit magical about her Grandma’s biscuit tin, and when she discovers that it can grant wishes, there’s only one thing she wants – chocolate! But Elsie’s wish to turn everything she touches into chocolate (even Grandma!) soon causes chaos. Can she get the magic biscuit tin to grant her one last wish to help change everything back?